Was Muhammad a Child Molester? Get Out of the Top 10%!!!! 70% of your Taxes Are Stolen! Kochs Force Skyrocketing Healthcare Premiums! Took off early from San Bernadino. Very pretty views of Mt San Jacinto with the sun coming up and a cloud deck partially obscuring the mountain. Made great time on I10 and then veered off on 60 and wound my way up to 89 in the "Congress" area. Shortly after Congress there is a section of 89 where the lanes are split so there is no oncoming traffic. I had a Ferrari ahead of me with a bunch of local Harley's ahead of him that knew how to ride the road. Not having oncoming traffic was a HUGE help for me ... one of my biggest weaknesses cornering is backing off the throttle as soon as oncoming traffic shows up (my snake brain isn't very trusting of oncoming drivers!). The ferrari had to be a V12, it had an unearthly screaming howl like a pack of wounded coyotes on rock concert amplification. I saw like "20ish" different exotic cars, mostly high end Porche, but I definitely IDed the Ferrari symbol on the one that was ahead of me ... and then let me by. In Prescott I pulled up next to a Lamborghini, but I'm too bummed after the WI loss to keep trying to figure which one it was. In the early stages of that lane split section out of Congress a cop had what I'm pretty sure was a Countach pulled over -- I bet that was a nice conversation! I'm too conservative to really enjoy going fast on curves ... but with the front suspension work on the wing and just Harleys rather than crotch rockets ahead holding back the Ferrari, I was fine ... did a little grinding on the bottoms of the boards a few times, and since I could keep up, I did. I'd say that run from Congress to Prescott has to be way up there in the world for corner speed daemons. Somewhere in that section before Prescott I went by Yarnell ... here the group of top notch firefighters died a year or two ago. 89a up to and beyond Sedona was a lot more sightseeing ... I had traffic ahead of me for most of both. WOW, the Jerome mining town hacked out of the side of the mountain would be a geat place to spend some time in! I think I was in a bad mood the only previous time I was in Sedona since I was driving a chevy pickup with a camper on and sick of "rocks". It was damned pretty this time. Would be nice to come out and spend some time there with the bikes. Me and Flagstaff just don't get along! The temp dropped back down to 48 as I went up there from Sedona, and there were some flakes of snow in the air! THIS TIME though the bad stuff looked to be JUST to the NW and I scooted to the east on 40, making it here to Gallup NM, 600+ mi for the day, 1500 miles or so from home ... a hard day and an easy one to go the way I look at it! 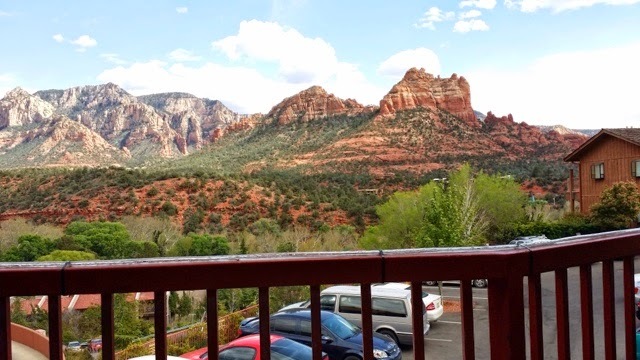 Was in Sedona 3 weeks ago. Pretty country. Would have been nicer on a bike than in an SUV.